Ervaar de duistere kant van New Orleans met deze 1,5 uur durende spookwandeling door de Franse wijk. Wandel met je lokale gids door donkere zijstraten terwijl je verhalen hoort over het bovennatuurlijke en de gruwelijke omstandigheden van hun dood. Stop op een van de meest spookachtige locaties van de stad onder dekking van de nacht, waaronder enkele voormalige bordelen, het huis van een beroemde voodoo-beoefenaar en een bar waar veel paranormale activiteiten plaatsvinden. This is hands down one the best murder related tours I've been on, and I've been on quite a few over the years in different places. Really amazing storyteller. Not cheesy at all which I sincerely appreciate, and has a LOT of knowledge to share. If you're into the macabre, and trying to decide which tour to book, this is absolutely the one. I can't wait to take my friends when we go back for another visit! Was a good tour in spite of the fact it was a cold as a witch's kiss that night. Emily was a real trouper and kept the large group well informed and moving safely through the streets. Lots of good stories and answered all questions presented. Our tour guide Bill DeLaVergne did an excellent job on the tour. He is a wealth of knowledge and provided a great tour on a very cold night with a group of 22 people. We visited several sites and learned a lot about each site. 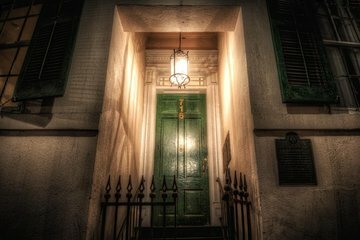 Have previously done various other ghost/haunted tours in NOLA but didnt learn as much as we did on this tour. He provides a lot of personal knowledge in addition to what is available from online sources. Makes you want to get more information on these sites. Highly recommended! Our guide for this tour was very energetic and knowledgeable. I truly enjoyed her. I was disappointed that we didn't get to go into any of the houses/places on the tour. You basically just walk around, hear the stories and look @ the houses. I was fine with the walking - it was just the standing around that I didn't care for. I think it would be an improvement if you gathered someplace, sit and hear the stories and then just walk by the places since you can't go into them. Randy was a great guide. Very informative and entertaining. I highly recommend the tour. This tour was great! Our tour guide Randy was exceptional. His story telling was so animated and interesting and it was so cool to learn about the darker history of New Orleans. Would definitely go on another tour with Randy! This was a great tour. We thoroughly enjoyed it and enjoyed hearing some of the less popular stories of the history of New Orleans. We did a lot of walking and went all over the French Quarter. I found it very interesting and informative. The tour was very interesting and it was nice to see a side of New Orleans I never knew about. Be prepared to walk a lot and at a fast pace but we had breaks at 2 bars which was nice. Unfortunately you don't get to go inside many places but the stories themselves are still very cool. Worth trying! Great tour! Our guide, Randy, was incredible, very knowledgeable, fun and engaging. We loved the oldest bar in the country and the Nicholas Cage house. Randy did an amazing job and was the best part of the tour, if we come back we will request him for sure.